PDF files can be attached as an underlay to a drawing file. Much like raster image files and external references (Xrefs) a PDF underlay is not part of the drawing, but is linked to it. In the parent drawing the path to the underlay is saved. You can edit the path to make sure the correct PDF is found. By default the folder of the parent drawing is search first. If the PDF underlay is not found there, the saved path folder is searched. If the PDF underlay is not found there either, BricsCAD reports a 'Missing or invalid reference' in the drawing. The PdfAdjust command allows to adjust the fade, contrast and monochrome settings of a PDF-underlay in the command bar. The PdfAttach and -PdfAttach commands insert a PDF file as an underlay into the current drawing. 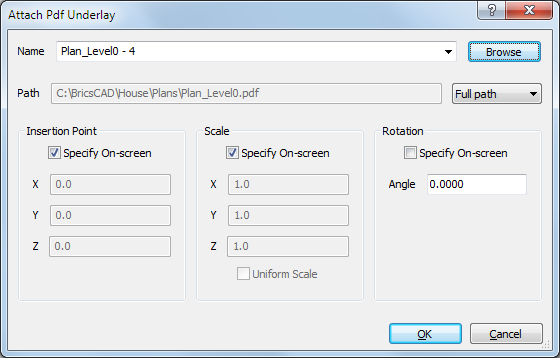 The PdfLayers commandaAllows to control the display of layers in a PDF underlay. The PdfClip command crops the display of a PDF. You can choose between a polygonal or a rectangular boundary. Each instance of the same PDF underlay file can have a different boundary.. The PDFOSNAP system variable allows to snap to the geometry in the PDF underlay if the system variable is On. The PDFNOTIFY system variable controls whether warnings for missing or modified pdf underlays are issued. The XNOTIFYTIME system variable defines the frequency to check for modified externally referenced resources: xrefs, images and pdf attachments if XREFNOTIFY, IMAGENOTIFY and/or PDFNOTIFY is ON. 1: Display and plot PDF frames. 2: Display but do not plot PDF frames. A multi-resolution persistent image cache is used to display attached Pdf underlays, enabling (very) fast zoom and pan operations. The highest cached resolution is 5000 x 5000 pixels. Still, when zooming in very close, the display of the Pdf underlay will become pixelated. So a hybrid modus can be used which switches to real-time generation of crisp Pdf underlay display when zooming in very close. The initial generation of the image cache may take a few seconds, from then on processing gets (very) fast, and remains like that in subsequent sessions. 1 = use Pdf cache, switch to real-time generation when zooming in very close. 2 = always use Pdf cache (default). Click the Attach pdf tool button ( ) on the Insert toolbar. Click the New tool button ( ) on the Details toolbar of the Drawing Explorer - PDF Underlays dialog. Type PDFattach in the command bar, then press Enter. The Select PDF Underlay File dialog opens. 2. Select the file, then double click the file or click the Open button on the Select PDF Underlay File dialog. The Attach PDF Underlay dialog opens. 3. In case of a multi-page PDF, click the down arrow in the Name field, then select the page of the PDF you want to load. Full path : The full path will be searched when the drawing is loaded. If the overlay is not found there, the folder of the parent drawing is searched. If the overlay file is not found there either, "Missing or invalid reference" displays at the insertion point of the PDF overlay. Relative path : The relative path, with respect to the folder of the parent drawing, will be searched when the drawing is loaded. If the overlay is not found there, the folder of the parent drawing is searched. If the overlay file is not found there either, "Missing or invalid reference" displays at the insertion point of the PDF overlay. No path : Only the folder of the parent drawing is searched when the drawing is loaded. If the overlay file is not found there, "Missing or invalid reference" displays at the insertion point of the PDF overlay. 5. Choose whether you want to specify the Insertion Point , Scale and the Rotation angle on-screen or not. The Attach PDF Underlay dialog closes. 7. Depending on the insertion options chosen in the previous step you are prompted to specify the Insertion Point , Scale and/or Rotation angle. Choose Drawing Explorer > PDF Underlays... in the Tools menu. The Drawing Explorer - PDF Underlays dialog opens. Right click and choose Insert in the context menu. Choose insert in the Edit menu on the Drawing Explorer - PDF Underlays dialog. The Drawing Explorer - PDF Underlays dialog closes. 4. Continue with steps 3 through 7 of the previous procedure. Click the frame of the PDF underlay. The frame of the selected PDF highlights. 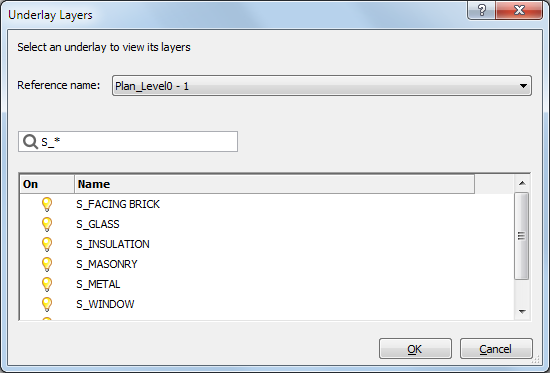 The properties of the underlay display in the Properties Bar. Under Misc , click Show underlay in the Properties Bar, then select Yes or No. Type PDFlayers in the command bar, then press Enter. You are prompted: Select PDF underlay. 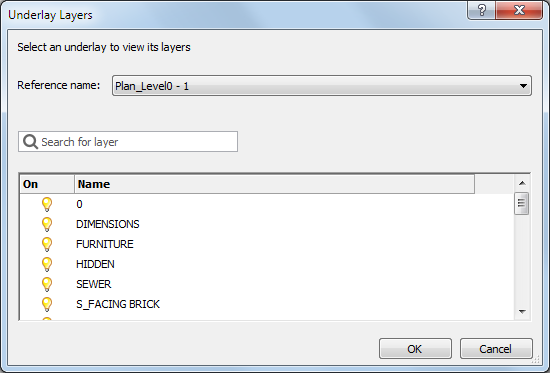 The Underlay Layers dialog opens. The icon in the On column indicates the current state of the layers On ( ) or Off ( ). 3. 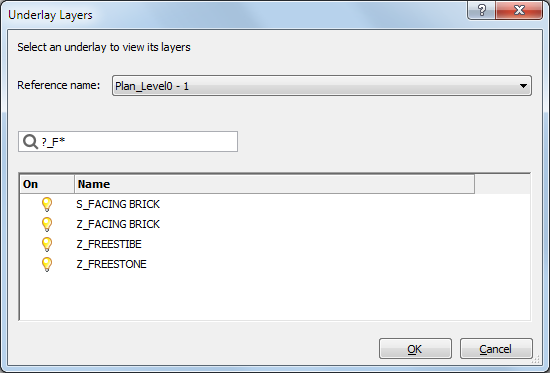 Click the icon in the On column to toggle the display of a layer. 4. (option) Click the Search for layer field, then type a layer name to search for a layer. Layernames starting with 'S_' only. Layernames of which the second and third character is '_F' only. Click the Reference name button to select another PDF underlay. Click the OK button to stop. Type pdfclip in the command bar, then press Enter. Choose New boundary in the prompt menu. Press Enter to accept the New default command option. Press Enter to accept the Rectangular default command option to define a rectangular clipping boundary. Type P, then press Enter to define a polygonal clipping boundary. 5. Define the clipping boundary. The defining points must lie inside the frame of the PDF underlay. If you click outside the PDF underlay the point is placed on the PDF underlay frame. Under Misc , click Show clipped in the Properties Bar, then select Yes or No. Choose Delete boundary in the prompt menu. Type D in the command bar, then press Enter. The clipping boundary is deleted and the complete PDF underlay displays. The PDFADJUST command allows to adjust the Fade , Contrast and Monochrome settings of a PDF-underlay in the command bar.